This volume is a translation of Jens Schröter’s 2007 book Von Jesus zum Neuen Testament (Tübingen: Mohr Siebeck, 2007) and is the first entry in the Baylor-Mohr Siebeck Studies in Early Christianity series that aims to bring substantial German works to an English-speaking audience. 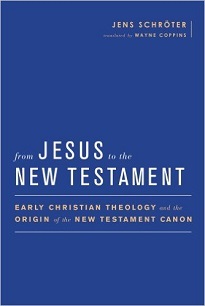 As the first volume of the series, Schröter’s study of the New Testament canon is strategic. Indeed, engaging the story of how the New Testament canon came to be involves wide swaths of history, theology, and literature. The studies in this volume were written independently and edited together to form this collection. Schröter asserts that the common point of reference in each essay is “the question of what the Christian understanding of reality is founded upon and how this understanding, which has its foundation in the writings of the New Testament, can claim a place in the discussion of the interpretation of reality” (xiii). He asks, How did the early churches form “a distinct religious self-understanding?” (1). His task, in other words, is ambitious, inter-disciplinary, and requires deep integration of the history, literature, and theology of the New Testament. The book’s four major parts reflect the formation process Schröter seeks to delineate. In part one, Schröter examines the nature of the historical task and what it actually means to reconstruct a history of a collection such as the New Testament (chaps 1-4). In the context of asking “how the past is appropriated as history and becomes a common point of reference for a community,” Schröter zeroes in on the “identity-creating function of conceptions of history” (1). A community’s identity-shaping “history” is not happenstance, but rather comes through a “constructive” effort to frame formative events of the past through “interpretation, placement in larger contexts, and differentiation from competing interpretations” (1). For Schröter, this methodological discussion informs and sets the parameters on a historical investigation of the early Christian communities and the way their identity is formed in light of Jesus, the apostles, and the traditions associated with them. He ends this section on the “hermeneutics of history” with a case study on the resurrection of Jesus (chap 4). Belief in the resurrection, Schröter contends, does not end the historiographical pursuit of the early church but rather guides the construction of meaning and the interpretation of traditions (68-70). Building on this historiographical discussion, in part two, Schröter examines the traditions surrounding the figures of Jesus, Paul, and Luke. In each of these areas, Schröter seeks to illuminate the “formation of a distinctive Christian view of reality” that emerged within “the framework of a Jewish discussion” (xiii). In part three, Schröter moves to consider what these traditions look like “on the way to the New Testament” (249). Here, Schröter first considers the relationship between Jesus and the Gospels (chap 12) and the apostles and the book of Acts (chap 13). Schröter then considers the emergence of the New Testament canon within the stream of early Christian history and literature (chap. 14). In this section of the book, Schröter “thematizes the development” (xiii) of individual traditions and writings as they formed into an authoritative collection that becomes binding on the Christian communities and foundational for their social identity. 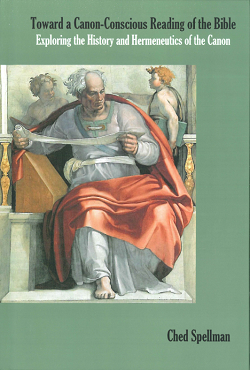 Schröter concludes the volume in part four with a reflection on the nature of “New Testament theology.” Here, Schröter seeks to integrate his historical and literary investigation into a comprehensive account of New Testament theology. What meaningful impact, Schröter asks, is the canon to have on the theology of the New Testament writings? Because the New Testament canon represents a discernible effort to correlate the various diverse strands of Christian teaching and preaching, Schröter concludes that “a theology” of the New Testament is both possible and legitimate even on explicitly historical grounds. The study of an authoritative New Testament canon is not merely a dogmatic imposition but represents a historically verifiable pursuit (see 317-49). Thus, this collection of “binding” writings represents the core consensus and confessional worldview of the early church. According to the “canonical principle” of the early churches, “the New Testament writings mutually and in this placement together are an expression of Christian faith” (341). Therefore, “canonical interpretation” is entirely appropriate precisely because “it corresponds to the emergence of the New Testament canon” (341). Schröter’s historical defense of the legitimate role of the canon in the interpretation of the New Testament is cumulative (building on the studies throughout his work) and instructive (relevant to recent developments in canon studies). One obvious value of this volume is Wayne Coppins’ clear, readable translation of Schröter work. This window into German scholarship on the New Testament canon is very helpful. Schröter himself characterizes the translation as one that shows “great care” and “an astonishing sensitivity” to the original German text (see xii). This means that there are some long, complex sentences and phrases that feel translated (e.g., the decision to use “New Testament science” rather than “New Testament studies”). On the whole, though, the prose reads cleanly and clearly. Because the editors chose to include cross-references to the original German edition, this English volume is a well-suited entry-point into this important area of German scholarship. Schröter’s treatment and integration of historical, theological, and hermeneutical areas demonstrate also that a full account of the New Testament requires all three lines of inquiry. Isolating one of these elements will produce a needlessly thin account of the New Testament canon. For instance, even while discussing the “construction of history” in the early Christian communities, Schröter immediately clarifies his intent to connect this analysis to the emerging canonical texts of this community (e.g., see his introductory clarifications, 1-2). In this move, Schröter also continually highlights the “interpretive character of historical work” (2). This type of methodological analysis will be helpful for scholars working on the history of the New Testament canon as they critically consider their own interpretive assumptions when examining the data (e.g., in the minimalist-maximalist debate). Another example is the way that Schröter deconstructs the false dichotomy between “theology” and “history.” For Schröter, the book of Acts is a case-in-point. Forcing Luke to be either a theologian of redemptive history or a historian of the early church is problematic and inadequate. Because he foregrounds historiographical methodology in part one, Schröter is well-positioned to demonstrate that Luke as a competent writer is able to “rework” his historical and cultural knowledge “into a conception that allows the developments about which he reports to appear as a coherent complex of events directed by God” (3; see esp. his discussion of “Luke as a historiographer,” 205-226). This is not a suspect process of interpolation but rather a task that is simply a feature of a biblical author’s compositional strategy. This particular feature of Luke’s work in Acts, then, informs the book’s role within the literary context of the New Testament canon. Further, in this canonical context, Acts connects the theology of the Gospel narratives to the theological discourse of Paul and the other apostolic epistles (see 273-304). For Schröter, the canonical context both preserves the real diversity of the New Testament writings and also presents a means by which these writings can function as a unity. The New Testament canon itself, then, represents “the historical formation of this unity” (343). Through each of these areas of study, Schröter demonstrates the need for interpreters of early Christianity, the apostolic writings, and the New Testament canon to consider their assumptions, methods, and the manner in which they relate history, hermeneutics, biblical texts, and the nature of canonical collections. While readers of SWJT will likely strongly disagree with some of Schröter’s historical-critical starting points, his substantive work in this volume will need to be taken into account by those seeking a robust understanding of the New Testament canon. Also in SWJT 58.1 (Fall 2015): 122-24.